Let’s say you’re a global tourist and instead of looking for ancient ruins, five star restaurants or sun-splashed beaches, your goal is to spend your time in cities ravaged by pollution. Where would you look? Beijing citizens have a cynical slogan: “Don’t trust air you can’t see,” but the city itself doesn’t rank near the top of the most-polluted cities in the world. To find pollution, you would first look to India, where 28 cities are listed among the 50 most-polluted. China comes in second on the list, with only 5 cities near the bottom of the list. 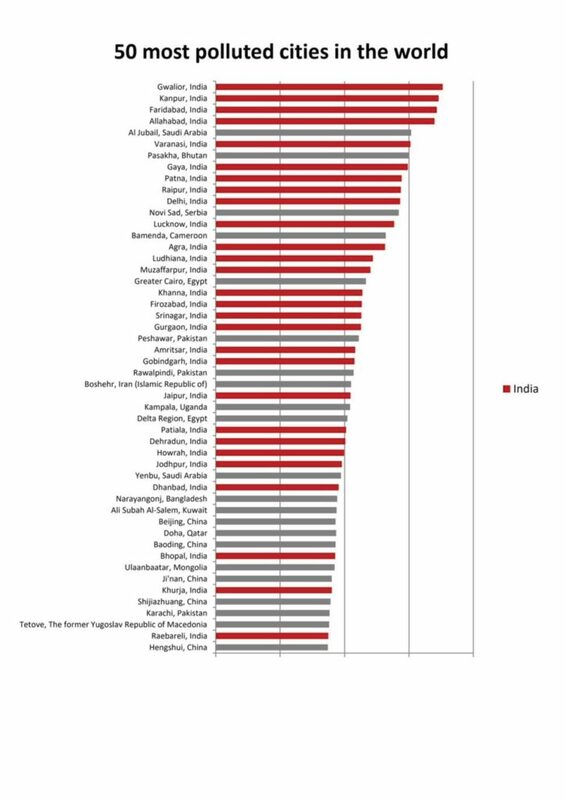 As you can see from the chart, Asian countries dominate the list, mixed with a few from Africa and the Middle East. South America and Australia are notably absent as is the U.S., Mexico and Canada, and the only European city on the list is Novi Sad in Serbia. Obviously, the U.S. has a long way to go before our cities are completely healthy. But our journey is perhaps not quite as long as others.